The price comparison search engine below finds the cheapest car hire deals for Mil Palmeras. It compares over 500 different companies including the major global car hire companies as well as local Spanish companies based in Mil Palmeras. Giving you the lowest and cheapest price for renting a car in Mil Palmeras. The price comparison tool will compare all the latest Mil Palmeras car hire quotes and prices and car rental rates between the major international brand name car hire companies as well as national and local Spanish car hire companies saving you both time and money. It is free to use – just put in your dates for your car hire Mil Palmeras and tell us what type and size of car you want to hire – then let the price comparison booking engine do the rest. Mil Palmeras is situated 15 minutes away from Murcia airport (approximately 20 km) and 35 minutes from Alicante Airport which is approximately 60km away. Mil Palmeras is a popular seaside resort on the south Orihuelan Coast. Mil Palmeras on the Costa Blanca coast of Spain is a wonderful area to explore when you visit or come on holiday. The Costa Blanca is famous for its sandy beaches, scenic coastline, traditional Spanish fishing villages and of course the wonderful sunny and hot climate. Mil Palmeras car hire is a great option as hiring a car gives you the flexibility to explore a different area each day. 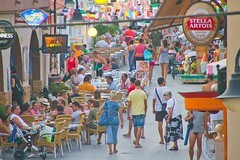 There are many famous Costa Blanca tourist attractions and sights to see. With your hire car we recommend taking excursions to include visits to Alicante and Torrevieja which both have historical, shopping and nightlife attractions. Torrevieja with its squares, promenades, beaches and water parks are just seven kilometers away. Cabo Roig with its strip of restaurants and bars and Campoamor are less than ten minutes away by car and have plenty of restaurants and bars. To the south of Mil Palmeras are historical towns such as Cartagena, a naval port, Murcia and Orihuela. Mil Palmeras is well-known as a golfing destination for which you will definitely need to hire a car. There are three golf courses located nearby at Real Club de Mil Palmeras, Villamartin and Las Ramblas. If however, you have no interest in getting out and about and exploring the area around Mil Palmeras and you just need to get to your hotel, apartment or villa rental in Mil Palmeras, then when you arrive at Alicante airport or Murcia airport you have the options of getting a taxi, an airport transfer to Mil Palmeras or private minibuses or shuttle buses are available as well to Mil Palmeras which is only around 30 minutes drive away from Alicante airport. You will need to consider the location of your accommodation in order to decide whether you should hire a car for your Mil Palmeras holiday. To be fair, Mil Palmeras is the sort of place where if you are centrally located and you have no interest other than relaxing on the beach, renting a car is not essential because Mil Palmeras is quite a compact small resort. If you are renting an apartment, then you will find that generally most apartments in Mil Palmeras are in built-up areas full of shops, bars and restaurants and most likely is within walking distance to the nearest beach. If however you are renting a villa in Mil Palmeras then typically they are mostly in the outlying suburbs. Although many holiday rental villas will have some facilities nearby such as shops and restaurants, you are restricting your choices dramatically and it is unlikely you will be anywhere near walking distance to any beaches. We have carried out extensive research comparing all the major Mil Palmeras car hire companies. These include: Advantage, Budget, Dollar, Alamo, Easy Car, Enterprise, National, Goldcar, Thrifty, Sixt, Victoria Rent a Car, Sol Mar, Record Rent a Car, Hertz, Auriga, Europa, Europcar, Atesa, Avia and Centauro Rent A Car. We have found when hiring a car in Mil Palmeras you need to shop around – there is no Mil Palmeras car hire company that is always the cheapest. Much depends on your dates and the availability of the various models of car hire that each Mil Palmeras car hire company has for those dates. Contacting each Mil Palmeras car hire company can take hours and hours and be very confusing so the best way to find cheap car hire in Mil Palmeras is to use a car hire search-engine which trawls the web in seconds and scours all the reputable Mil Palmeras car hire companies with your specific information i.e. the dates for your Mil Palmeras car hire, where you want to hire the car from (and drop it off), the size of car hire needed etc. If you click on the link above you will go to a page containing the best search engine for cheap Mil Palmeras car hire that we have found. It’s from an independent company called Car Trawler. They have special discounted internet rates with all the major Mil Palmeras car hire companies and using their tool they compare all the rates from the various Costa Blanca car hire companies and then give you the cheapest price for car hire for Mil Palmeras. * What’s included in the Mil Palmeras car hire price and what ISN’T included. You can come across some very cheap Mil Palmeras car hire prices but they often won’t include unlimited mileage, local taxes or insurances. * When you hire a car or rent a car in Mil Palmeras always check whether the car has air-conditioning – especially if you are hiring a car in summer. * Book ahead. Mil Palmeras is very busy in the summer and Mil Palmeras car hire companies will often run out of cars for hire. You also tend to get a better Mil Palmeras car hire rate by booking in advance. * Don’t always choose the cheapest Mil Palmeras car hire. Rather than hiring a car in Mil Palmeras which you can barely fit into you will often find the price difference is usually small to upgrade to a more comfortable Mil Palmeras car hire. The different car groups to choose from are mini, economy, compact, midsize, standard, full size, people carrier, luxury, premuim, sports car and convertible. * Child seats. Many Mil Palmeras car hire companies do not always have these available – out tip is to take your own – you simply check-it in at the airport with your luggage and you will save on your Mil Palmeras car hire bill. * When hiring a car in Mil Palmeras check that what you have booked you receive when you are at the offices of the Mil Palmeras car hire company. Do all of this before you sign all the paperwork. Make sure you take any car hire print-outs you have so if there are any problems you have it all in writing. * Check your Mil Palmeras car hire for damage. When you’ve got to your Mil Palmeras car hire you naturally just want to get going but make sure the car hire in Mil Palmeras company acknowledge any bumps and scrapes already on the car. * Petrol. Make sure your Mil Palmeras car hire uses diesel not four-star petrol as it is much cheaper to buy diesel in Mil Palmeras. *Excesses. Some Mil Palmeras car hire companies have very high excesses which means you pay an amount (for example €500) if you have an accident and they cover the rest. Be aware of how much the excess is before you book your Mil Palmeras car hire. If you are hiring a car in Mil Palmeras, we highly recommend you look at our related map page, weather and tourist guide. As you will see from our map of Mil Palmeras areas close by include to the south of Mil Palmeras is Pilar de la Horadada, San Pedro del Pinatar and La Manga. 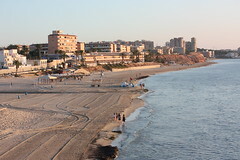 To the north of Mil Palmeras is Dehesa de Campoamor, Cabo Roig, La Zenia, Playa Flamenca, Punta Prima, Residencia Los Altos and then Torrevieja. Cheap Car hire in Mil Palmeras – Page Summary – This page contains unique content about our Mil Palmeras car hire price comparison website tool which compares and finds you the lowest and cheapest prices for car rental and car hire from Mil Palmeras in Spain.